Vasilli has recently released the SDR# TETRA plugin on his website RTL-SDR.RU (note that the site is in Russian, but can be translated with the Google Translate option in the top right of the page). Previously it was only available via ever changing forum links, so it's good to see that it has a permanent home now for the latest version. This plugin allows you to listen to TETRA digital voice via SDR#, without needing to set up any complicated GNU Radio based receivers which were necessary in the past. We also note that as discussed in a previous post there is a companion program for this plugin called TETRA Trunk Tracker. Had the same problem on a Win7 64bit machine, solved it by installing all the Microsoft Visual C++ Redistributables the way up from 2010 ,installing just the x86 versions is sufficient enough, to run the new plugin without crashing. Cha-ching! That’s did the trick, thanks! 2013 x32 was the last one I installed before it started working. Impossibile caricare la DLL ‘libtetradec’: Impossibile trovare il modulo specificato. (Eccezione da HRESULT: 0x8007007E). Sad, but it crashes immidiately after pressing Decode. 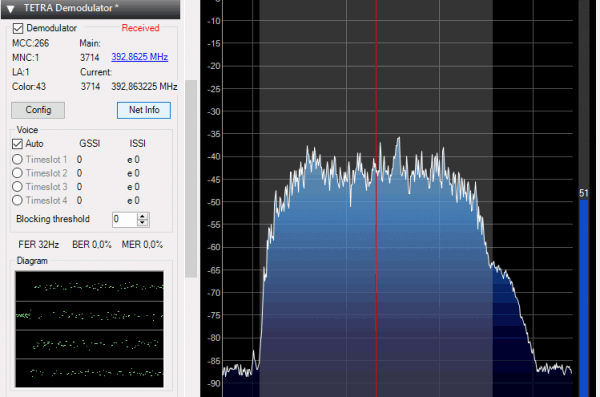 SDR# 1700, Windows 7. This plugin not work on my 64bit window machine. Plugin added as described in readme file but sdr#1700 version crashes after some time not show any data and voice. However I am new to tetra decoding but no success. Are you running the 64-bit version of SDR#? Use the x86 version, since this plugin is compiled for x86 only. I think there is only one version available on sdr# i.e SDR# x86 rev 1700 for Window https://airspy.com/?ddownload=3130. Can you provide a link for 64 bit sdr# version. However I am using windows 10. Works without issue on my Win7 64 bit machine. Unfortunately, all it does is cause SDR# to crash. Not much else I can do except remove it. Working fine here. Are you using the latest version of SDR#? Did you download the latest version of sdrsharp and extract the files in to an empty directory. And then read and followed the instructions in the README.txt file included in the plugin tetra_x86.zip (copy 2 files to the sdr# folder and add one line of text into the specified config file. I did that and it works for me.